This is the first in a series of costume posts I will be making leading up to Halloween. 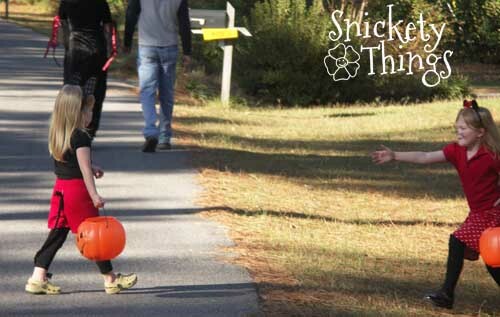 I'm really big on making the Halloween costumes my kids will wear. For the last few years, I take what they tell me they want to be and try to make it happen with things we already have, or can be bought easily and inexpensively. Today's costume is Mickey and Minnie Mouse from 2010. This picture may be pinned or shared on your blog as long as it is not changed in any way. 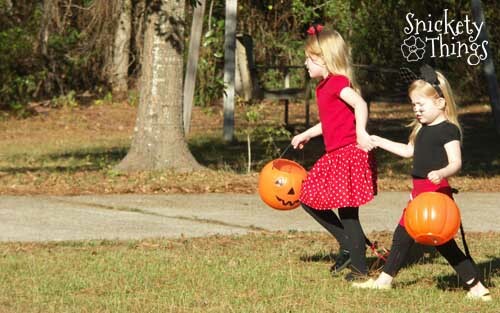 The costumes were actually pretty easy to do and these were both girls' choices. I'm glad they want their costumes to match or be similar. We had mouse ears left over from the Mickey Mouse birthday parties (here and here). The red shirt on Minnie is just a uniform shirt from the girls' school. It had poofy sleeves so I thought it would fit. 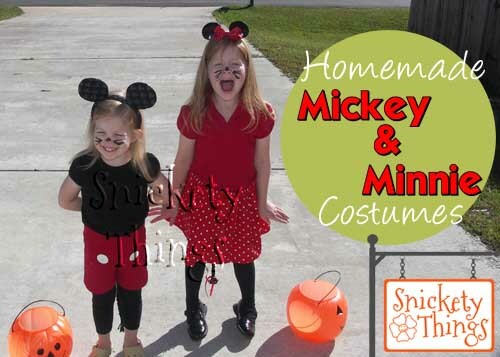 The black shirt on Mickey is one we had bought ot go with another outfit. Those are just black tights on Minnie and black leggins on Mickey. 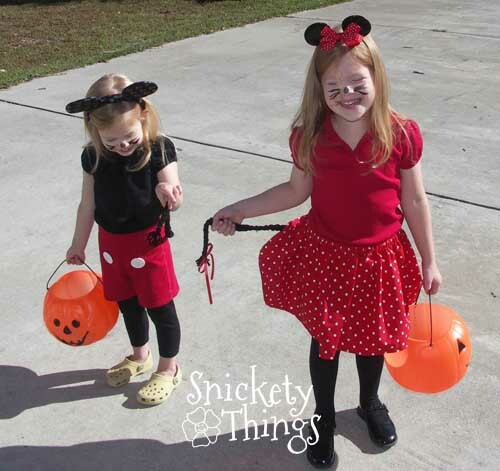 The shoes on Minnie were her black dress shoes, while Mickey is wearing yellow Crocs that were passed down to her from her older sister. The tails were just braided black yarn that was safety pinned to the rear. I bought the red shorts on Mickey on clearance at Walmart for $2, but they started out as boys' pants. I just cut them down and hemmed them to become shorts. I bought the two large white buttons to sew on the front for $1.50 each. The skirt on Minnie was made from a yard of fabric I bought at Hobby Lobby on sale. For one yard it cost me about $1.50. I just sewed a pocket for elastic at the top and hemmed the bottom, very simple. I had the elastic and thread already. This means I spent less than $7 on these costumes. Here they are showing off their tails. All of the photo posing left me realizing I had a Mickey mouse with attitude. 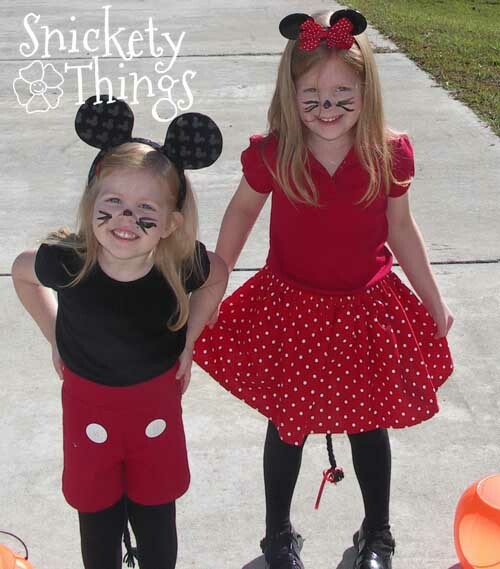 The girls really enjoyed wearing these costumes while they went Trick-or-Treating. The Princess wanted to make sure no mouse was left behind. Later on, she thought if she just held on to her sister, she wouldn't get left. So I'm both sad that summer is almost over and happy that you are so on top of things as to help the rest of us with Halloween ideas! I've noticed my kids won't wear the scratchy polyester costumes, so I'm loving this one, since it's "real" clothes! Almost all of the costumes I've made them are from their real clothes. While mine will wear anything, I don't like to spend a lot on something they might wear once. I'll be posting more costumes soon. Oh gosh, how cute are they! 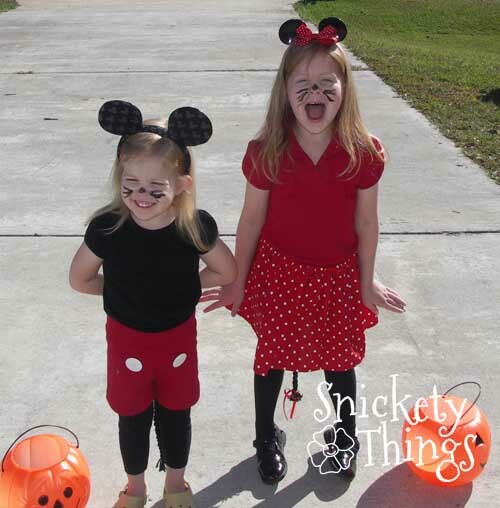 Adorable costumes! I love them. There's only one word really: ADORABLE!!!! Super cute! I love when families go w/ a theme.